Oversharing or over-caring? Being a professional skier in the digital age means doing a lot more than just skiing. This story originally appeared in the February 2015 issue (43.6). Brody Leven hadn't really done anything as a skier when Salomon signed him head-to-toe as a four-season paid athlete in December of 2013. Well, that's not exactly true. He'd accomplished more than most skiers will in their lifetime, including first descents, trips to several continents, skiing from the summit of Denali, and writing several articles for a spattering of websites. But he'd never filmed with an established movie company or had any significant photos published in a magazine. By the metrics traditionally used to measure an athlete's exposure, Leven was a veritable no-name. The 27-year-old's biggest asset is that he's as motivated about documenting his adventures as he is about completing them. His self-produced edits, photos, and trip reports have garnered him more than 35,000 Instagram followers. He is perhaps the best example of how social media has democratized the process of becoming a professional skier. 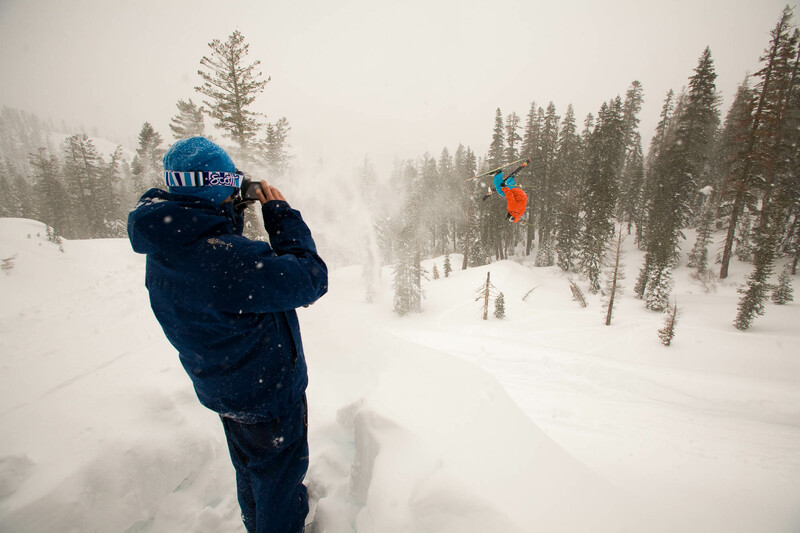 Since skiing for a camera first became a job, going pro has required third-party validation. A photographer or cinematographer had to decide you were worth shooting and an editor needed to publish or include you in a film. There has always been the college student or the dishwasher rising from obscurity, but until recently, it required a Steve Winter or Kris Ostness taking a chance on you. The word 'social' is like 'Internet' before the dotcom crash. Everyone knows they "need" it, but do they get how? Social media has eliminated that gateway. Gone are the days of, "He's a great skier, he just hasn't had the chance." The opportunities are there now, but as before, it takes more than just being good. It takes hard work, determination, and at least a modicum of skill at photography and social engagement. But then, getting sponsored based on factors beyond straight skiing ability is nothing new. With this, though, comes a new set of challenges, the biggest of which is that many people—including those in control—don't understand what's going on. The word 'social' is like 'Internet' before the dotcom crash. Everyone knows they "need" it, but do they get how? Marketing managers see numbers and automatically see value where it might not exist—especially amid revelations about how to buy followers. In Leven's case, Salomon jumped in with eyes open. "His considerable social following was an obvious attraction, but it was as much the type of engagement that he had with his followers as the raw number," says Mark McCambridge, who was Salomon's outdoor brand manager at the time of Leven's signing. "He brought people into his adventures (and misadventures) and then talked with them about it, and none of it came from a 'greater than thou' viewpoint." Salomon's use of social analytics in signing and compensating athletes doesn't stop at Leven, nor is this limited to Salomon. Most brands at least consider social following, if not pay bonuses or tie in compensation based on it. Such rewards are just a short evolution of the photo incentive—the basis of ski contracts for decades—only more measurable. The problem with this is that with so many skiers marketing themselves and their sponsors, the social-media-sphere blurs the lines beween what is real and authentic, and what is simply marketing. "It's much easier to quantify the outcome of something that Brody's involved with digitally than the possible effect of a cover shot or film segment," says McCambridge. "This isn't to say that the value of a film-part or a cover is insignificant, merely that [social is] easier to measure. In the best case, you get all three: large following (with good engagement), film segments, and covers." For athletes, this creates an ultimatum: engage or watch your spot go to someone who does. Look at Rachael Burks, indisputably one of the best big mountain female skiers of her generation, and simultaneously a fine-dining waitress. As far as pro athletes go, Burks is practically invisible on social media. She doesn't post to Facebook and her Twitter is just a feed from her Instagram. Her following of 3,000 there is impressive for most people, but modest compared to skiers who are less accomplished (and who list "model," not "server," as their other job). Burks says she's removed social media requirements from past contracts because she's not comfortable putting out an image solely for the sake of a brand, but that the brand doesn't need to take responsibility for. "I don't want to be on Facebook personally, so I feel like it's very disingenuous for me to be on Facebook projecting images just for marketing," she says. "When skiing ends, you still have everything that you put online. Whatever projection of self you put on there is going to be on there forever. I don't want to be fake with that." The end goal, Burks quickly admits, is to sell skis and that a strong social image can help. She also notes that for some it's not a huge personality departure. "Some people have it in them," she says. "That's part of who they are, and it works well with their personalities. It's just not my thing." Some take it further, arguing that it is not only not enough to be the best skier, it's no longer required. "People who would have had a tough time being on a grassroots team 10 years ago are now front and center," says Kästle and The North Face skier Griffin Post. "Whether that's better for skiing is debatable." The "good for skiing" argument itself is nebulous. Ski company X sponsoring skier Y for posting mostly SUP yoga shots has no effect on the density of British Columbia powder. The question, like it or not, is if it sells equipment, which isn't as easily measured as counting "likes." When someone picks up Powder or watches a Poor Boyz film, you can be fairly certain you have a qualified customer. On the social side, is that follower a potential customer, or just a fan of the same football team? If social media helps not-so-good skiers get sponsored, it also gives motivated ones control over their own fate. Leven owns his social impressions. His worth is tied to that, not to a film company that could cut him. When he and photographer Jim Harris decided to ski every named line in Utah's Wolverine Cirque, they didn't need anyone to sign off. They just went. The reward for their followers was a cool story that never would have made the cut in a magazine or a ski movie, but that provided some brief inspiration. The true downside is that all this noise can be incredibly annoying. And if that's how you feel, there's an easy solution.